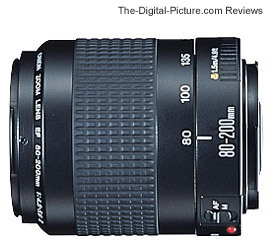 The Canon EF 80-200mm f/4.5-5.6 II Lens is a very small, very light and very cheap telephoto zoom lens. There is no sticker shock when checking the price on this lens. But, as often is the case, you get what you pay for. - Lacking USM, the 80-200 focuses relatively slowly and makes some noise doing so. There is no FTM (Full Time Manual) focus and, in fact, there is no manual focus ring. You are expected to twist the extended portion of the Canon EF 80-200mm f/4.5-5.6 II Lens' barrel to manually adjust your focus distance. 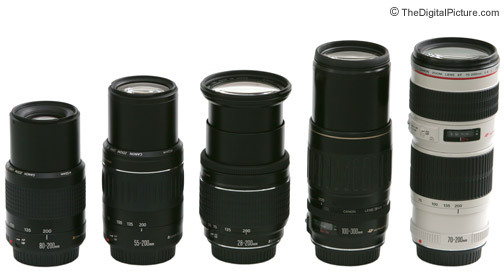 With the Canon EF 80-200mm f/4.5-5.6 II Lens, you also get very cheap build quality. Included is a plastic mount, excluded is a distance window. The zoom ring is sticky - it does turn smoothly. A slow lens with only 5 aperture blades, the Canon EF 80-200mm f/4.5-5.6 II Lens aperture starts at f/4.5, moves quickly to f/5.0 by 95mm and to f/5.6 around 135mm. The 80-200 gave me two aperture clicks at 100mm with f/5.6 selected in AV mode - another one of those things that make you say "Hmmmm..." The 5-bladed aperture will of course produce 5-pointed OOF (Out Of Focus) highlights. With a low build quality often comes light weight. With a slow lens often comes small size. The Canon EF 80-200mm f/4.5-5.6 II Lens comes through with both of these features. 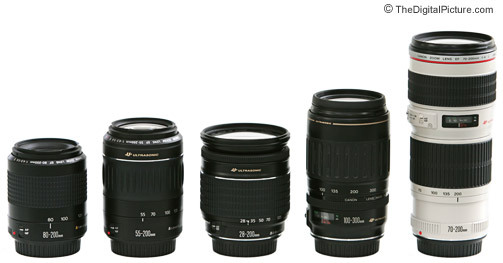 From left to right in the picture above are the Canon EF 80-200mm f/4.5-5.6 II Lens, the Canon EF 55-200mm f/4.5-5.6 II USM Lens, the Canon EF 28-200mm f/3.5-5.6 USM Lens, the Canon EF 100-300mm f/4.5-5.6 USM Lens and the Canon EF 70-200mm f/4L USM Lens. The same lenses are pictured below extended to their maximum length. With a minimum focus distance of 4.9', the 80-200 is not going to make a good closeup lens. The maximum magnification the 80-200 will produce by itself is .16x. The Canon EF 80-200mm f/4.5-5.6 II Lens's focal length range is nice but not unusual. It matches well with the Canon EF 28-80mm II Lens. These lenses also match in many of their other characteristics as well. Optically, the Canon EF 80-200mm f/4.5-5.6 II Lens is disappointing. Sharpness generally requires the aperture to be stopped down to f/8 to become decent. Corners are soft at the wide end even on a 1.3x FOVCF body. Distortion is present even on a 1.3x FOVCF body. Slight barrel distortion is apparent at 80mm. Pincushion distortion shows up from 135-200mm. CA (Chromatic Aberration) is apparent at the long end. Vignetting seems to be well controlled. Basically, the Canon EF 80-200mm f/4.5-5.6 II Lens is a very cheap telephoto zoom lens with performance relative to its cost. It can get the job done, but if you are looking for good image quality over a wider aperture range, I highly recommend the Canon EF 70-200mm f/4L USM Lens.